The Floodstopper multi-zone package was designed specifically for larger residential applications as well as commerical applications with a need to quickly identify the source of the leak where large numbers of sensors are utilized. The multi-zone controller can monitor 4 separate zones and alert you to the zone that was triggered via its LCD display pannel. The multi-zone controller can monitor up to 250 sensors per zone (1,000 sensors!) and is fully compatible with the wireless accessories. A leak in any one of the 4 zones will cause the valve to close and turn off the entire water supply at the valve location. 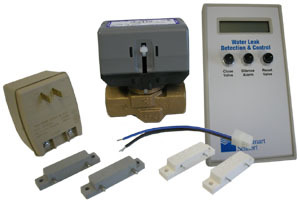 This package comes complete with everything you need to keep your home or business safe from a major water leak, including the FloodStopper multi-zone controller, the actuator and shut-off valve assembly, the 24 volt power supply transformer (plugs into standard electrical outlet! ), and 4 sensors - two top terminal (gray) and two rear terminal (white). Additional sensors or wireless accessories can be purchased separately.